Thing #3 shoved me into a role I was not at all prepared for seventeen years ago. God told me that the role of "Music/Theatre/Choir Mom" will now be played by...MOI? It was black and white that I was ill equipped. I was pretty darn excellent at being a "Sports Mom". I had two go-rounds and perfected the role with Things #1 and #2. But Thing #3 pushed me onto a new stage. And for someone who only sounds waaaaaaay awesome when singing in the shower, or in the car by myself...I knew nuthin' 'bout 'nuthin in my new role. Lots of improvisation, acting, and a "show must go on" attitude ensued. Yes, by Thing #3...but mostly by MOI! I spent last weekend up in Providence, Rhode Island where Thing #3 was selected to perform in an All-East Choir. It was pretty cool. 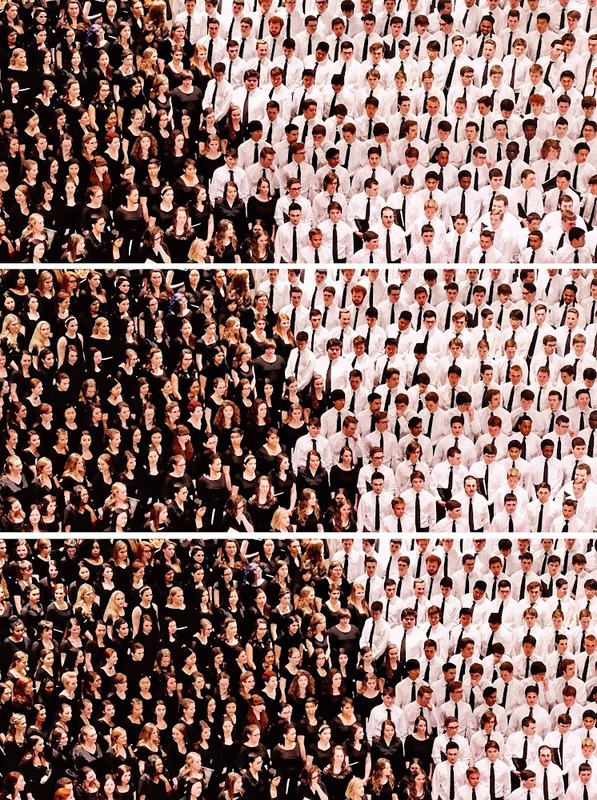 A mixed-choir of high school students from Maine to Maryland. Oh, the glorious voices. Oh, the abundant talent. Oh, I can't believe I'm just starting to get the hang of this "Music/Theatre/Choir Mom" thang and it's almost all over! 1. The parent who is obviously living their dreams thru their kids. Whether it be a athlete or a movie star. They push, they are performance driven. Instead of supporting their kids interests and dreams, they often alienate them, or burn them out. 2. The parent who leaves after their own child's role/performance is done. You know, as soon as their kid has had their "at bat" or their "singing solo". 3. The parent who thinks their kid is the best, and works overtime to make sure YOU know it too. With Things #1 and #2 I use to get REALLY PEEVED at these parents. With Thing #3 (and maybe my advanced age and wisdom) I now kinda feel sorry for them. It's obvious they are insecure and need to put others down in order to elevate themselves. Okay, it is STILL irritating. But I feel a bit better undertanding they have issues of their own to deal with long after the game, or production, has ended. 4. The parent who fails to appreciate the lessons that come with getting knocked down. Whether it is a loss in a game, or not getting a role you auditioned for. Casting blame or making excuses is all you will get from these parents. 5. The parent who doesn't STICK. You know the ones. They take their kid to another travel team, or to another theatre production when things don't go their way. As a result, they don't teach the important life lessons of perseverance and commitment. Instead, they foster a "the grass is always greener" mentality in their kids, and themselves. Turns out, I really had nothing to worry about at all. Not that I've ever let that stop me. I'd seen it all before. Luckily, the good far outweighs the bad and ugly. And that is a fact both on the playing field AND the stage. It's just that black and white. It makes it a bit easier to put it all into perspective. At least from MY point of view. I have to say I really enjoyed my years as a Music, Theatre, Choir parent. Waaaaay less sweating. I got to dress up more. I didn't leave performances with a raspy throat from yelling and cheering, just sore hands from clapping. I had MUCH better "hair days". I consumed way less Advil. And....the seating was sooooo much more comfy than bleachers and benches. Regardless of which "parent" role I was playing with each of my three Things, I was far from giving a brilliant performance. But a few things were always constant despite the venue...my pride, admiration support and love were ALWAYS present. It's as simple as Black and White. I love your perspective on these things. I think adversity and failing are all part of growth. Those that rise above adversity are better off than those who have to be recognized. Some parents think every opportunity and accolade belongs to their kid alone. You are so right about it boiling down to insecurity. Our boys are awesome soccer players, but there is one particular phenom on the fields that really draws deserved attention. We make sure we model cheering for this guy to show our kids that they should give credit where it is due. I love the way they have learned to be happy for his success while learning it doesn't diminish their own achievements. They are truly proud of their competition. Oh that must have been wonderful. There's nothing like a child who sings and just lights up the place. My grandson Jacob is our chorus kid, in 9th grade. He made our Maine district choir but not All State this year. His voice has just started changing. He still has 3 more years to go. My heart just bursts with joy listening to him sing. They are angels. As a teacher I so see these types of parents. The pictures are amazing - I'm sure the sound was, too! #1 It happens all the time. #2 It happens all the time. #3 It happens all the time. #4 It happens all the time. #5 It happens all the time. So much wisdom here! I was recently engaged in a conversation on facebook about this generation - the millennials and those who come after them - and how they just don't measure up, haven't been allowed to face and deal with challenges or difficulties because their parents are always moving them on to those "greener pastures". It makes me sad in some respects but extremely grateful in others. I had a mom who didn't think the sun rose and set on me (or my brother) and my grandparents, who had the primary raising of us, were the "rub some dirt on it" types. I was always encouraged to do my best (both in sports & choir ;) ), but if I struck out, there would be another at bat. Amen to everything you said, and just when I think I've seen it all...someone proves me wrong. And being down on the sidelines of the football games, I can hear things the parents say so much better than sitting in the stands, and I can always match the kid on the sidelines with his yelling parent. Great shots....and I really miss my girls choir performances. The all-region was my favorite - so hard to believe that these kids come together for only a couple of days, to learn songs that sound as if they've been singing together for months!! Cool Triptych although I have no idea which one is "Thing #3". I do admire parents who go all out when their kid is involved in activites like yours were/are. - I was so not that kind of a parent. Don't get me wrong I love my kids (even though they were step-children) I never considered them that. They both tried sports but really didn't excell at them so they eventually lost interest. Which was okay by me because I never really was that into sports. Now with a Grandchild that likes music I'm much more involved as a Grandparent as we attend her concerts and recitals with gusto & pride. It was interesting to read your thoughts on the different "types" of parents. Great shots - love it! A proud moment I am sure ~ very creative triptych ~ glorious! That had to be fun/annoying/frustrating/enjoyable! :-) Isn't life a hoot, dealing with parents? Nice post and the photos were great. Parents can be crazy. It's part of why I prefer goats to teaching these days. Fabulous photo composition! Love it! Yeah....parents will be parents....(I have six *things*) I've never blended well with any group of parents. Amaaaazing shots!!! and the post is absolutely great! You are so right on your parents categories and how hard it is to sometimes blend in! But yes, it is still a great ride once you get the hang of the parent crowd! No matter what our kids drag us into the most important thing is our support. I say go for it mama!! Love the photo! Thanks for sharing with SYC.